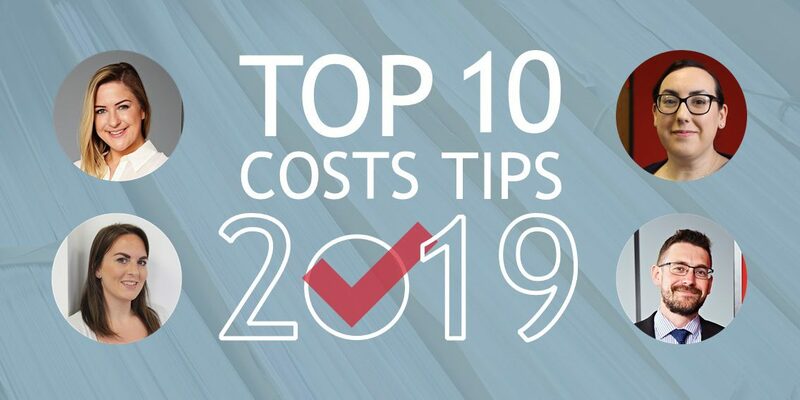 To bring in the new year we’ve asked some of our experts for their top costs tips, which we’ve put together for you into a handy top 10 guide! We hope that you find something new to put into practice in 2019! Wherever possible, negotiate Counsel’s fees at the time of their instruction. You have much more bargaining power prior to their instruction than we have when we approach them following the conclusion of the matter seeking a retrospective reduction to their fees. You are therefore likely to secure a more substantial reduction if you negotiate this with Counsel before they are instructed than we are able to following the conclusion of the matter. Even if you are able to negotiate a reduction at the time of Counsel’s instruction, we would of course still seek to secure a further reduction following the conclusion of the matter and in which case you may even benefit from a double reduction! Be clear in your assumptions! Be clear in your assumptions within your costs budget, particularly in respect of the disclosure phase. Where possible, state exactly the level and scope of disclosure you anticipate there will be. If the level and scope of disclosure is greater than anticipated, there will be a better chance of a revised budget being agreed/approved. Keep an eye on your budgets! Keeping a close eye on agreed/approved Budgets will also assist with maximising recovery. Unless a good reason to depart from the Budget can be established (and the threshold for doing so is high), a Solicitor will be limited to the figures in the agreed or approved Budget and quite often we find when preparing Bills of Costs at the conclusion of claims that Budgets have been exceeded and as a result costs are essentially being written off. The costs incurred in relation to each phase should be monitored as the claim progresses to avoid any general overspend as such overspending will not be sufficient to provide a good reason to depart from the Budget. Furthermore, if there is a significant development in the litigation, the Budget should be updated and agreed/approved at the earliest opportunity to ensure the additional costs incurred as a result are recoverable. Be aware of your funds! When taking over a file from another firm and the matter has been Budgeted, be aware of the potential issues this may cause you if a particular phase still requires work and there is a possibility that the previous Solicitor may have already utilised all the funds. A certain level of review is required in order to establish whether there are any funds left and whether an Application is required at that point. Apply for court fee remissions! Don’t forget to apply for Court Fee Remissions unless you have evidence the Claimant would not be eligible for the same. Properly Record your Time Spent! Ensuring that time spent on the file is properly recorded with explanations as to the work done (particularly if a substantial amount of time has been spent) would assist with the fee earners’ recovery. Estimated time is assessed harshly by the Courts, with some Judges simply striking out all estimated time claimed, it is therefore better from a recovery point of view if the time is recorded on file. We would certainly expect the benefits gained from recording the work done to outweigh the time taken to record it. Get a detailed breakdown of any CCMC! If a Costs Advocate is not being sent to the CCMC then ensure that Counsel provides a full and detailed breakdown of what has been agreed at any CCMC. This must include the figures agreed for each of the phases and broken down to the extent that they were awarded by the Court. The importance of this cannot be underestimated as this information is essential when it comes to the preparation of the Bill of Costs and complying with Practice Direction to Part 47 5.1A. Be careful with terminology when settling modest cases, settlement by Part 36 or including ‘standard basis costs’ within an Order will not automatically circumvent the application of Fixed Recoverable Costs. In view of their focus on proportionality, Courts tend to look favourably upon delegation. Thus to avoid finding yourself in a situation where a Grade A fee earner has carried out all of the work on a file but the Court has only allowed a Grade D guideline hourly rate for the more straightforward work, it would be advisable to delegate such work to Grade D fee earners wherever possible to free the Grade A Solicitor to conduct work in respect of which they will be able to recover their Grade A rate. When sending a file to MRN, be sure to refer to our How to send us a file document to ensure that your documents arrive safely!